If you have a newer model car and look into the trunk you may see a less than a full size temporary spare tire or no spare at all. Instead of a spare tire, 2012 Hyundai Elantra, Cadillac and Porsche have a “tire mobility kit”. If you are driving a newer model Ford, Honda, or Volkswagen chances are that you may have a less than regular size temporary spare tire in your trunk. Keep in mind these tires are not meant to be driven for more than 70 miles. Also, it is not advised to speed on those tires more than 55 miles per hour. You can replace the flat the same way you change a regular size tire. If you have a Hyundai, Cadillac or Porsche, you may have mobility kit instead of a tire. It contains a sealant and a compressor which will help you to reinflate the tire. This is only a temporary measure and you still need to drive to a tire shop to get the tire fixed. 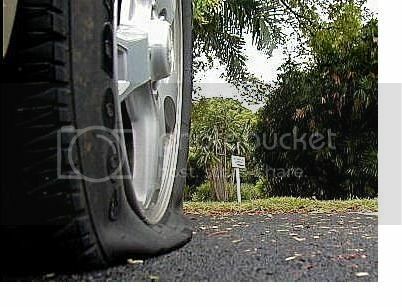 You can also run on a flat tire provided that you have reinforced sidewall tires like in BMWs and many Corvettes. Drive slowly to the nearest repair place.